Written in the grand ‘ripping yarn’ tradition of the high adventure story… —The Vancouver Sun. Winnipeg, 1914. Tom Macrae is working on his law degree and enjoying the company of his sweetheart, Ellen. When the call to arms comes, both Tom and Ellen are torn from their secure, settled lives in the prairie city. Tom finds himself hunched in the trenches, amid the mud and horror of the Great War, while Ellen faces an uncertain future in Tom’s absence. His prospects bleak, Tom serves with the Canadian Cavalry Brigade, in the thick of the stalemated struggles on the Western Front. In addition to the soldiers’ comradeship, Tom discovers the strong bonds of trust between the soldiers and their horses. With his own horse as his closest companion, he dodges a hurricane of shells, machine guns and swords, and in the clamour, faces his finest hour. 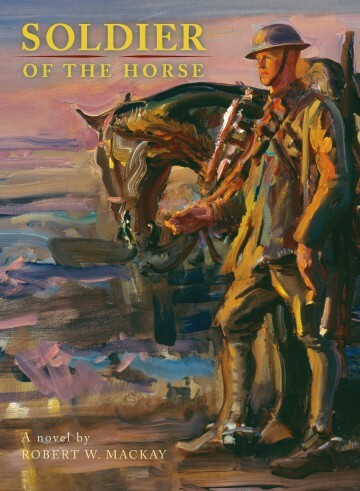 Inspired by his own father’s story and letters about fighting in Picardy, France, Robert W. Mackay has written a novel that brings to life the great military history and traditions of the Canadian Cavalry.